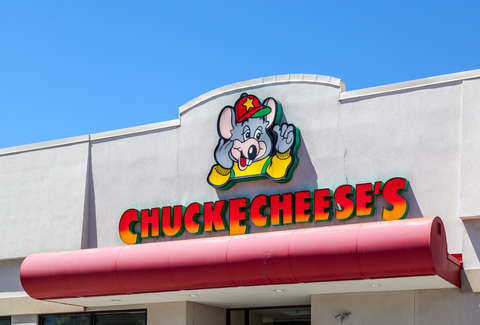 Far be it from us to assume anything about you, but it's hard to imagine you've ever visited a Chuck E. Cheese's just to eat the pizza. It's not exactly known for its food so much as it is for its children's arcade reigned by a literal band of creepy animatronic rodents. Still, you'd probably want to know if the pizzas they're serving are actually just cobbled together using reheated pieces from discarded pies, right? Well, that's the latest rumor milling around the internet, and we're here to break it all down for you. For years, there have been whispers on the web that the pizzas at Chuck E. Cheese's are actually made by piecing together uneaten slices from other pies. It's a truly bizarre theory, but it's one that picked up steam again this past week after YouTuber Shane Dawson released a video to investigate the claim. To get to the bottom of it, he ordered a pizza at two different CEC locations, and they both came out looking a bit... strange. Specifically, the edges of the slices didn't seem to match up, which seems to add credence to the notion that the folks behind the scenes aren't actually serving fresh pies so much as recycling and reheating what's left from ones they've already served and presenting them as new. To be clear, the folks at Chuck E. Cheese's were quick to deny the claims. In a statement to The Verge, representatives characterized the rumors as "unequivocally false." Further, they explained the misshapen and seemingly mismatched slices as simply a byproduct of their freshness. "No conspiracies here -- our pizzas are made to order and we prepare our dough fresh in restaurant, which means that they’re not always perfectly uniform in shape, but always delicious,” the company spokesperson said. Dawson's video essentially aimed to validate a rumor that's rumbled for years. For instance, in a Yahoo Answers forum from a full decade ago, someone posed the question of whether Chuck E. Cheese's recycled its pizza. The thing is, there didn't seem to be any evidence to support the hypothesis then, and there doesn't seem to be any evidence now, despite what the pizzas may look like when they arrive at the table. While some took to Twitter to share photos of weird looking pizzas they'd been served over the years at CEC, former employees also jumped to the chain's defense. One former employee who spoke to Buzzfeed thinks the rumors are funny, but wholly false. "In my years there, not once did I ever see a pizza even make it back towards the kitchen. They were always thrown in the trash even if it was a pizza that went untouched by the guests," she said. She also explained that the cutting tool used to slice the pies may be the culprit, in addition to the fact that the dough shrinks into weird shapes when it's in the oven. "When it goes through the oven, the pizza shrinks. It warps and depending on the amount of cheese or toppings there is variation in the size and shape, hence why the slices aren’t always the same length," she said. So relax and enjoy that misshapen Chuck E. Cheese's pie without fear -- it's probably fine.